Ken Griffin rests at the Lincoln Memorial Cemetary, about one mile south of Rt. 34, on Rt. 30, just south of Aurora IL. In honor of the organist that made the most impact on my interest in organs. 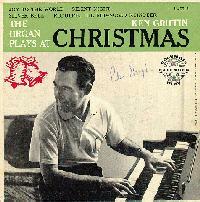 When I grew up back in the 60's and early 70's, I heard Ken Griffin more than any other organist. We must have had every Ken Griffin record ever made. They were always in the 99 cent pile back in the 70's. If you see any interesting stories on Ken Griffin or any of our featured organists, let us know! Share with all! We will work on putting some audio clips of Ken Griffin here. If you want to upload some, let me know. Recently I went into a record shop and Sony had a CD of Ken Griffin Waltz favorites. The title is Actually "Ken Griffin Waltz Favorites", and there is no mention of the sales-dampening word "organ" anywhere on the label. I was shocked. Wow! A CD. Never thot I'd see the day. The CD is by Sony Music Special Products, # A-23389, Bar Code# 0-7989-23389-2, Sony/Columbia Records, 666 Fifth Avenue, P.O. Box 4450, NY, NY 10101-4450. The CD was available for awhile at CDNOW.com but I haven't seen it lately. It was very rare to see Ken Griffin's picture on an album. In fact it wasn't until this year (1996) that I ever saw his picture at all. The above photo was submitted by Ron Newman from Aurora, IL whose mom knew and worked with Ken at radio station WMRO in the 1940's. but I never possessed this particular record. I never realized it but Ken died a long time before my time. News accounts of his untimely demise follow. "Text courtesy of the BEACON-NEWS, AURORA, ILLINOIS. Used by permission. Reproduction or distribution of the text of these articles, in whole or in part, is strictly prohibited without permission of the publisher. For further information, contact: BEACON-NEWS, 101 S. River St., Aurora, IL 60506." The headline reads: "Ken Griffin, Organist, Has Heart Attack"
Ken Griffin, nationally known organist, who got his start in Aurora, is confined to Sacred Heart hospital, Spokane, Wash., following a heart attack, it was learned today. Following the attack last week it was hoped Griffin's condition was not serious. However, it has since been reported he will be confined to the west coast hospital for some time. Griffin first became popular in Aurora as a featured entertainer in the West Side Beer Garden. He later moved up River Street to Mike Covelli's Rivoli, where he scored a success with his WMRO broadcasts. From the Rivoli, Griffin went on to national fame and last season was the top selling organist in the country with his waxings for Columbia. His last Aurora appearance took place three years ago when he presented a concert in the West Junior High auditorium. More recently many Aurorans made trips to Chicago to see him at the Old Heidelberg, where he finished a successful long run prior to going to the west coast. During his Chicago stand he was also seen on several TV shows including the Courtesy Hour and In Town Tonight. "HEART ATTACK TAKES LIFE OF KEN GRIFFIN"
The text of the article follows. Where "(sic)" appears, is to indicate text as written in the article. Ken Griffin, formerly of Aurora and well known here as an organist and entertained, died Sunday afternoon in a Chicago hospital three hours after suffering a heart attack, his second within a year. Griffin had the distinction of having made the best-selling record produced by a solo instrumentalist, "You Can't Be True." ( NOTE: Yes, they forgot the "Dear" part! The text continues in the same paragraph:) In 1954, he was recognized as the top-selling organ soloist on wax in the United State. (sic) "You Can't be True" (sic) has sold more than 3,500,000 records. Griffin's career began at a Naperville restaurant, but he was hired shortly thereafter to appear at the Rivoli Restaurant in Aurora, as a result of early recognition thru (sic) appearances on radio station WMRO in Aurora. He was born in Columbia, Mo. Surviving are a sister, Mrs. Virgirl (sic) Kennedy, Denver, Colo., a brother, Kirby of San Francisco, Calif., and nieces and nephews. Funeral services will be announced by Daleiden's Lincoln Avenue Mortuary. follow in Lincoln Memorial Park. True," which sold 3,500,000 copies. served two years in the U. S.
Dec. 28, 1909 in Columbia, Mo. Special thanks to Ron Newman for taking the time to research and find these articles and thanks to the BEACON-NEWS of Aurora, IL for letting us share them with you. In 1965, my mother and father had an awful fight, because mom spent a lot of money buying a Wurlitzer organ (model 4070). I immediately began to study on it, and discovered Ken Griffin's records at the local shop. Most of my meager allowance money went to buying them. Over the course of two years, I managed to learn most of Ken's arrangements on songs I knew: Hi Lilly, Hi Lo; You Can't be true, dear; Syncopated Clock; and many others. That was great ear training for me. I managed to get an early gig playing the Hammond B3 at the skating rink in our town every Saturday for about an hour and a half. The ear training came in extra handy when the classical bug got hold of me - and church music took my extra time. I could play any hymn in any key because of what I learned from those Ken Griffin recordings. Never got to see his television show, but what a great musician he was. And what an early loss to the music world. I was told a very amusing story about Ken Griffin's (Hammond) A getting vibrato installed. It seems that he was playing the A with tremulant ONLY (imagine that) and supposedly had the old A pre-amp specially customized tonally by a tech. I presume that a capacitor was cut out for more brilliance. He had a scheduled appointment with Hammond for them to come out and install the vibrato kit. The organ was located in a house that contained absolutely nothing else except for the A. The techs showed up did the work and Griffin arrived after the work was completed. He spotted his old pre-amp on the floor and threw a horrible fit demanding that that pre-amp be re-installed. I was told that it took several epople to convince Griffin that he could not use his old pre-amp and keep the new vibrato. Doll Dance, Deep Purple, Tango De Fire, My Heart Stood Still, Canadian Capers, Lullaby of Broadway, All the Things You Are, She Didn't Say Yes, Blue Tango, Mood Indigo, The Continental & Valencia. Ken Griffin was originally a violinist and began organ study without a teacher. For four years prior to sound films, Griffin played the organ in film theatres in the Rocky Mountain States. Now there is something I didn't realize. (I just read it from the record jacket). "Prior to sound films"?? ?I didn't think of him as being that old! Ken Griffin was a very warm, gentle person. Great Wit...I even have a LP of his playing a theatre pipe organ. You have NO idea how much of a difference his style was on the pipe organ opposed to the Hammond. We all lost a lot of talent when he died. He had 3 Hammonds, one covered in mother of pearl. Ken is buried next to his father in Aurora, Illinois. Email the Webmaster - Jerrell Kautz if you have any information, photos, etc of interest on Ken Griffin to add to this page. My name is Patrick Noonan, E-Mail address Reynella@AOL.COM. I am 56 years of age. west of England, in the county of Devon. above the noise of the fairground. I noted your Sony/Columbia CD of waltzes and I am currently trying to obtain a copy here. a few CD's of all these other gems! must have given so many people much pleasure. Ken Griffin must not be forgotten. would appreciate an E-Mail sometime. havn't heard a word about them in years. Hope you enjoyed my two cents worth. I've been a professional since age 17. I played in clubs throughout the midwest and joined the list of organists giving concerts for the Hammond Organ Company in 1955. I became staff organist for A.B.C. Channel 7 in Chicago in the late 1950s doing shows like 'Jack LaLanne' etc. Being a typical musician I worked several jobs at the same time some were doing commercials at Universal Recordings, Columbia, Mercury etc. I was the organist for the Chicago White Sox for six years, the first organist for the Chicago Bulls when they started at the International Amphitheater. I was the organist, arranger and conductor for Al 'Jealous Heart' Morgan for 28 years. We appeared at many of the top show lounges, hotels and theaters, including the Tropicana Hotel in LasVegas and the Chicago Theater and Rialto Theater in Joliet. I am now semi- retired, but still teach. Enough of this. I first met Ken Griffin in 1947 when we were playing at the Symphony Show Lounge at 321 West 79th Street in Chicago. There were three acts. Ken and I were the organists and there was also a small combo that played between our acts. Ken was the entertainer. He played the organ, sang parodys and wore funny hats. I was lucky to have the featured spot. Ken always said he was an entertainer, not a musician. How wrong he was. In all the years we were friends, I never heard him play a bad chord or do anything that was not in excellent taste. He was very down to earth and loyal to his friends. I remember a night when we were playing at the Symphony and he came over and handed me a sheet of music. He said 'play this over Bob and let me know what you think of it.' I played it and truthfully wasn't impressed. I told him it was nice, but not for me. He told me he had just made a recording of that song at Chicago Recordings. I was really surprised as it didn't seem the type of material that Ken would use. To give an example of my judgement in music. The song was 'You Can't Be True Dear.' He made $108,000 and I was still working for $250.00 a week. I remember one evening when I was playing at the 'Barharbor Lounge' at 71st and Bennett in Chicago. Ken was appearing at the Chicago Theater. It was a Saturday night and he had just finished doing several shows. He was really tired and had just come to the lounge to listed to me and relax. I announced that he was in the room, he acknowledged the applause and kidingly I said 'would you like to play a number? ' He came on stage and played for an hour. That was the Ken Griffin I was honored to know. We were good friends until the time of his death. Years later I was doing a commercial for Libby Foods. We did the session at Columbia. The engineer came out of the booth and with great pride he said 'this is the organ Ken Griffin used for his recordings.' It was like a shrine to those people. There was a speaker in the studio, but no mikes on the organ. The engineer told me Ken always had the organ routed directly through the board. They didn't use mikes for my session either. They probably thought if that set up was good enough for Ken Griffin, it was good enough for me. It was. The session turned out great. doing concerts in, but he did it because he felt a bond with the veterans. problems getting Ken's organ up the stairs. liked to relate my suspicion at receiving this "funny money". would be in perfect shape. had there. His death was a shock to the post and especially my parents. of 78's and maybe an LP or two also. I was already a fan of Ken Griffin at the age of 16 back in 1961, and tried to come in touch with him by a letter to Columbia Records. They never replied, and I did not know that he had passed away 5 years earlier. So I started to find as much informations about him as possible, But that was not easy. Well, over long time - many years - I obtained several things via a number of other persons and magazines, etc. So one day, an organist in colorado got me in touch with Ken's sister in Denver. She and her husband come to Bergen, Norway, in 1982 on a cruise ship, and visited us at home for a few hours. The next year I took my first trip to USA and visited them - living in their apartment - whic I did several times later too. They had Ken's home model AV, and I had the great pleasure to play it - but sorry, they had changed the original A-cabinet for an old Leslie, and you know, that was not the Griffin sound! Now, that organ is given to a church in Denver, but is probably not in use there. A friend of us in Maine obtained to purshase one of Ken's mother-in-pearl travelling AV's from Ken'n family, and as the Griffin fan he is too, love to have it, and I have played it several times. Both the named organs are still just like new! Ken had also another similar travelling model, but we have not been able to find out where it is. We have also tried to find out where Ken's very special and decorative trailer might be, but no result. When I was in Denver first time, I loaned the five film reels containing Ken's TV shows "67 Melody Lane",- which was five 15-minutes programmes sponsored by Wurlitzer. He played an electrostatic Wurlitzer organ there,- the same he later used on several records. He never recorded pipe organs, so this information is wrong. The record where his name appears, is a falsum. He only recorded Hammond, and the two last years of his life - also the Wurlitzer electrostatic organ. The films were made in 1954. I also have visited Ken's grave in Aurora just west of Chicago. As somebody perhaps will know, he died at Sunday March 11, 1956, at 46,- after his second heart attack when playing in the Old Heidelberg Restaurant at 14. East Randolph Street - next door to the famous Oriental Theatre. This small and beautiful house are just now being incorporated in a new public art block - they will save the front only. For many years now, it was a steak house. Ken was sent by ambulance to Wesley Memorial Hospital in Chicago, and died after a few hours. Another thing told at the Griffin pages, is that Ken sais that " he was no musician but just an entertainer". This is wrong. At that time, there was two Ken Griffin in Chicago. One of them was an entertainer and radio show man, - and Ken always focused on the organ - that was just his profession! In fact, nobody have made so many Hammond organ solo recordings as him. Ken also made around 90 recordings for non-commercial use,- namely his Radio Transcriptions. These large sized LP's contained tunes he never recorded as commercial records,- but a number of them was recorded in different versions both for commercial use and the named ones. The sound quality of the "RT" recordings, in fact, was much better than the sound of the commercial records, so they must have had better studio recording equipment. The man having one of en's travelling organs, also have the original "RT" records - he must be lucky. I have copies of them myself. I'm planning a biographical and complete discography on Ken Griffin, but unfortunately, I do not know when I will be able to do that job. I have plenty of pictures of Ken throught the years - many of them never published. I have much more stuff on Ken, but I think that it will take too much place to include it here. Wilfred H�steland, P.O.Box 365, Sentrum, N-5804 Bergen, Norway. P.S. I should like to know where Ken's recording organ was placed in Chicago,- and perhaps what happend to it later....? We perused with great interest your Theatre Organ website featuring the late Ken Griffin. Our father, Jimmie Marando, owned and operated Marando's World Famous Theatre Restaurant in 1946-1972. Mr. Griffin frequently played at our dad's place in the early 1950s. He is listed among the entertainers on a new website we launched on New Year's Eve 2012 -- MarandosRestaurant.com. It was quite the place. Thank you!